SAN FRANCISCO, Calif.–(BUSINESS WIRE)–Today, BabyCenter®, the world’s #1 pregnancy and parenting web and mobile destination, and Collage Group, a leading insights and strategy company, released findings from their landmark new study, “Futurecasting Families: Early Insights into Generation Z & the Future of Parenting.” The two organizations partnered on this research to place Generation Z alongside current Millennial moms to offer an early look at how this young generation of digital natives will prioritize, shop, communicate, and connect when they become parents. The research primarily focuses on Gen Z women ages 18 – 20, both those with children and without, to examine their attitudes compared with Millennial moms (Gen Z moms defined as those born 1997-1999; Millennial moms from 1980 and 1996). 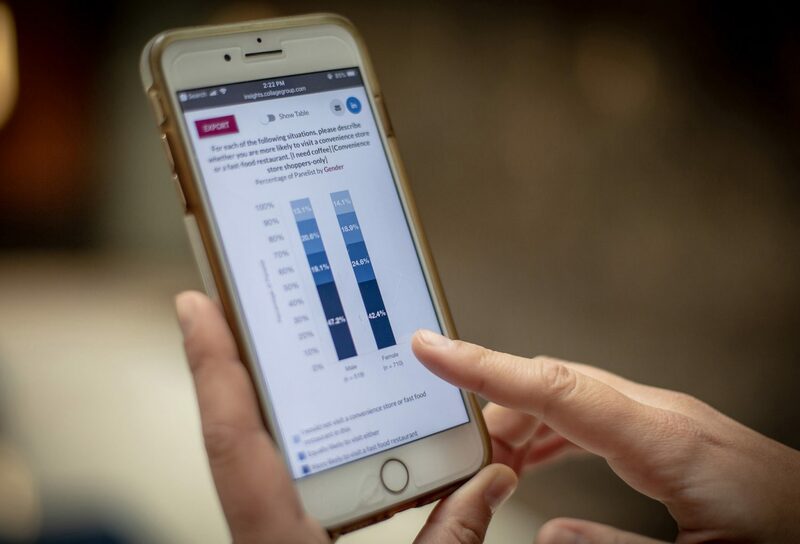 “Futurecasting Families” also includes the opinions of younger Gen Z teens, ages 13 – 17, to ensure that the study encapsulates a wider generational perspective on everything from ideals and values to technology and social media, and more. 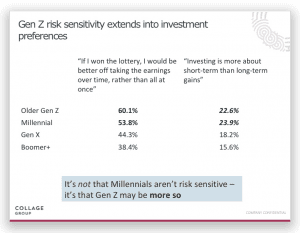 The results uncover important differences between Gen Z and their Millennial predecessors – differences that don’t necessarily fit with previously held assumptions. These distinctions will require brands and retailers to adjust their thinking and approach to successfully reach the next generation of parents. The new traditionalists: Gen Z moms are carving a unique path to adulthood, emphasizing “success” as a key measure of the ideal life. But even with this younger set, some traditional values, such as marriage and teaching responsibility, still hold weight – even more so than with their Millennial mom counterparts. 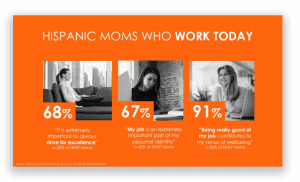 For example, no matter age and whether a parent, approximately one-third of Gen Z females say that “success” is a top ideal, while just one-fifth of Millennial moms say the same. On the traditional side, when asked if as children they pictured themselves getting married, more than 6 in 10 Gen Z females said that they envisioned the walk down the aisle. Social media is an ever-present tool: Gen Z has a very realistic, almost jaded view of social media. While they live much of their lives on these platforms, they don’t necessarily love them, and being connected all the time leads to a deep fear of missing out. More than 70 percent of Gen Z girls and Gen Z women without children report that they regularly experience “FOMO.” Interestingly, becoming a parent seems to soften some of that pressure – with that figure tumbling to 36 percent with Gen Z moms and dropping to 31 percent for Millennial moms. Higher reports of loneliness and anxiety: Likely due to the timing of the recession, and growing up in the aftermath of 9/11, Gen Zers have a more imperiled perspective than Millennials. Their own parents, Gen X, instilled a worry-filled mindset. Gen Z females, no matter age and parenthood status, are more apt to admit to being more anxious than most people (Gen Z girls: 57 percent; Gen Z women: 58 percent; Gen Z moms: 56 percent). This is in direct contrast with the emotional state of today’s Millennial moms, with just 44 percent reporting similar feelings of anxiety. In addition, Gen Zers have only known a life that places pressure on them to present outwardly exciting personas on social media. Less trust in the wisdom of the crowd: Gen Z moms trust professional reviews in line with Millennial moms (Gen Z moms: 27 percent; Millennial moms: 25 percent). 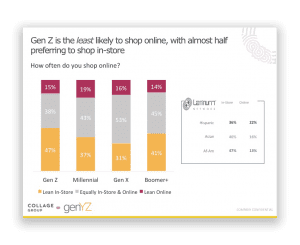 However, when comparing Gen Z moms to Millennial moms, there is a precipitous decline in trust of consumer reviews on Amazon, Yelp, and the like – highlighting the need for marketers to understand the value of content in context. New Gen Z moms need help and advice on the products they buy, but they won’t turn to sources that they don’t know and trust. The complete “Futurecasting Families: Early Insights into Generation Z & the Future of Parenting” report is available upon request. The report includes U.S. data from both BabyCenter Brand Lab Insights and Collage Group. BabyCenter fielded an online survey on the BabyCenter site and among its Global Parents’ Panel, managed by Research Now®, between November 13 and November 29, 2017. The BabyCenter sample includes 204 Gen Z moms and 1,752 Millennial moms. 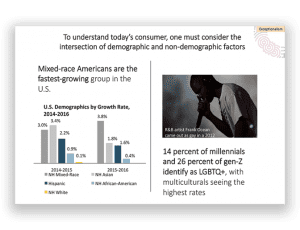 The analysis pairs BabyCenter findings with insights from Collage Group and its two-part series highlighting Gen Z attitudes (2016) and Gen Z digital trends and platforms (2017). The Collage Group sample cited in the insights includes Gen Z women without children, ages 18 – 20, and Gen Z Girls, ages 13 – 17. BabyCenter is the world’s #1 pregnancy and parenting digital destination, reaching more than 51 million parents a month in every corner of the globe through its 10 owned and operated properties in nine languages. In the United States, 8 in 10 new and expectant moms online use BabyCenter each month. BabyCenter provides parents with trusted information, advice from peers, and support that’s Remarkably Right® at every stage of their child’s development. 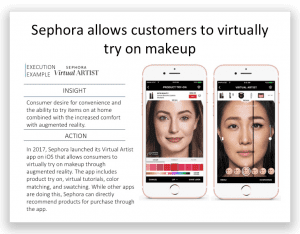 Products include websites, mobile apps, online communities, email series, social programs, an Alexa skill, a Roku channel, and more. BabyCenter also leverages its industry-leading audience engagement to provide unparalleled insights and innovative marketing solutions to the world’s top brands, retailers, and institutions. BabyCenter is committed to improving maternal health globally and, through its Mission Motherhood™ campaign, works closely with nonprofits, NGOs, and governments to help make motherhood safer for all women. BabyCenter LLC is a member of the Johnson & Johnson family of companies. Visit BabyCenter on Facebook, Pinterest,Instagram, and LinkedIn, or follow @BabyCenter and @MomInsights on Twitter. Founded in 2009, the company focuses on empowering organizations to better serve and engage the fastest growing and most influential consumers through insights, market intelligence and strategy. They support leading companies through proprietary syndicated research, actionable category level insights, market intelligence tools, and best practices. 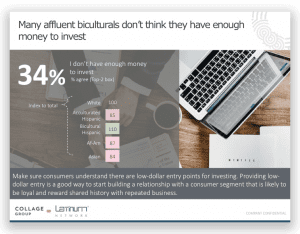 The product portfolio includes insights and strategy networks – Latinum, focusing on multicultural, and genYZ, focusing on millennials and gen-Z. Collage also offers a full suite of custom research and consulting services. More information can be found at collagegroup.com.